[166 Pages Report] MarketsandMarkets expects the global passive authentication market to grow from USD 440.0 Million in 2017 to USD 1,535.0 Million by 2023, at a Compound Annual Growth Rate (CAGR) of 25.5% during the forecast period. The forecast period has been considered from 2018 to 2023, while 2017 has been considered as the base year for estimating the market size. The major objective of this report is to define, describe, and forecast the passive authentication market by component, business function, deployment type, organization size, industry vertical, and region. The report provides detailed information related to the key factors (drivers, restraints, opportunities, and industry-specific challenges) influencing the passive authentication market growth. The report forecasts the market size with respect to 5 major regions, namely, North America, Europe, Asia Pacific (APAC), the Middle East and Africa (MEA), and Latin America. The report profiles the key players and comprehensively analyzes their core competencies. Moreover, this report tracks and analyzes competitive developments, such as mergers and acquisitions, new product developments, and Research and Development (R&D) activities in the passive authentication market. The research methodology used to estimate and forecast the market initiates with the collection and analysis of data on the key vendor product offerings and business strategies from secondary sources, such as Information Technology (IT) services providers, technology providers, press releases, investor presentations of companies; and white papers, technology journals, certified publications, and articles from recognized authors, directories, and databases. Moreover, the vendor offerings have been taken into consideration to determine the market segmentation. The bottom-up procedures were employed to arrive at the total market size of the passive authentication market from the revenue of the key market solution and services providers. 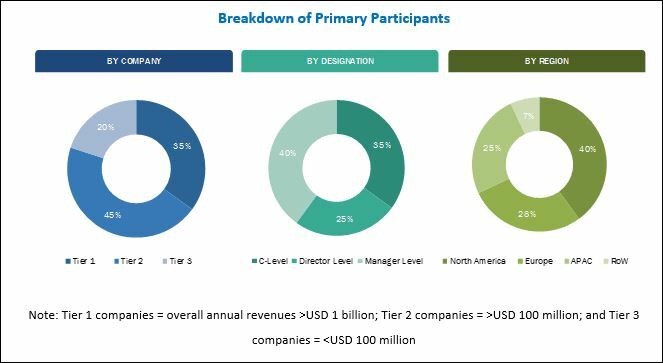 Post-arrival at the overall market size, the total market was split into several segments and subsegments, which were then verified through primary research by conducting extensive interviews with the key people, such as Chief Executive Officers (CEOs), Vice Presidents (VPs), directors, and executives. The major solutions and services providers in the passive authentication market include Aware (US), BehavioSec (US), BioCatch (Israel), Cisco (US), Early Warning (US), Equifax (US), Experian (Ireland), FacePhi (Spain), FICO (US), Gemalto (Netherlands), IDology (US), IBM (US), Jumio(US), LexisNexis (US), NEC (Japan), Nuance Communications (US), NuData Security (Canada), Pindrop (US), RSA Security (US), SecuredTouch (Israel), Trust Stamp (US), TypingDNA (Romania), VASCO (US), Veridium (US), and Verint (US). The global passive authentication market is expected to grow from USD 492.8 Million in 2018 to USD 1,535.0 Million by 2023, at a Compound Annual Growth Rate (CAGR) of 25.5% during the forecast period. The growing demand among enterprises to deliver an enhanced user experience and the increasing need for the frictionless authentication among organizations are expected to drive the market across all regions. 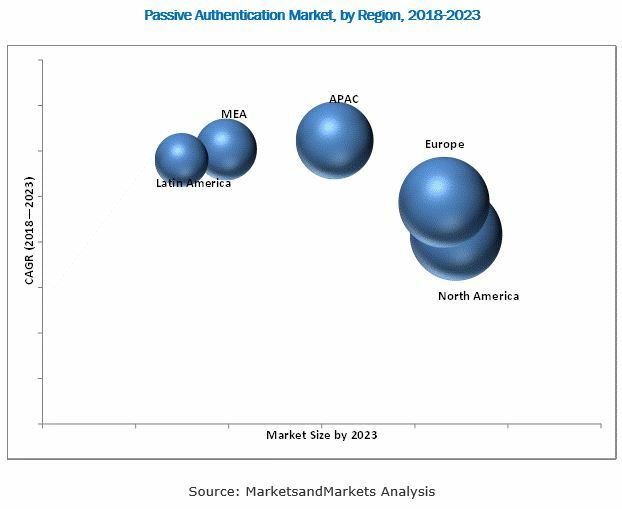 The passive authentication market has been segmented by component (solution and services), business function, deployment type, organization size, industry vertical, and region. The services segment is observing great opportunities among the industry verticals, as passive authentication services help companies provide personalized services and seamless customer experience to their customers. Among the services segment, the managed services segment is expected to grow at a higher CAGR during the forecast period. The cloud segment is expected to grow at a higher CAGR during the forecast period, due to the various benefits offered by cloud-based passive authentication solutions, such as cost-efficiency, scalability, high computing speed, and reduced expenditure on Information Technology (IT) infrastructure. Passive authentication solutions are deployed across various industry verticals, such as Banking, Financial Services, and Insurance (BFSI), government, telecom and IT, retail and consumer goods, healthcare, media and entertainment, and others (education, travel and hospitality, and automotive). The retail and consumer goods industry vertical is expected to witness the highest CAGR during the forecast period. Passive authentication solutions enable retailers to securely authenticate their customers for protecting their financials by leveraging unique human behavioral factors while improving customer experiences. However, the BFSI industry vertical is estimated to have the largest market size in 2018, as the growing transactional volumes and the increasing need to manage digital assets are expected to be the major factors in driving the passive authentication market size of the BFSI industry vertical. The global passive authentication market has been segmented on the basis of regions into North America, Europe, Asia Pacific (APAC), Middle East and Africa (MEA), and Latin America to provide a region-specific analysis in the report. North America is expected to be the largest revenue-generating region for passive authentication solutions and services providers in 2018. The region is an early adopter of biometrics, behavioral analytics, and mobile technology, thereby witnessing a significant growth of the passive authentication market. APAC is expected to be the fastest-growing region in the market. The growth in this region is primarily driven by the growing number of smartphone users, and the presence of the large number of Small and Medium-sized Enterprises (SMEs) in the emerging countries, such as Australia and New Zealand, China, and Japan. The passive authentication market faces challenges, such as security concerns related to data confidentiality and slow growth in the developing and underdeveloped economies. These challenges are expected to hinder the growth of this market. The major vendors that offer passive authentication solutions and services across the globe include Aware (US), BehavioSec (US), BioCatch (Israel), Cisco (US), Early Warning (US), Equifax (US), Experian (Ireland), FacePhi (Spain), FICO (US), Gemalto (Netherlands), IDology (US), IBM (US), Jumio(US), LexisNexis (US), NEC (Japan), Nuance Communications (US), NuData Security (Canada), Pindrop (US), RSA Security (US), SecuredTouch (Israel), Trust Stamp (US), TypingDNA (Romania), VASCO (US), Veridium (US), and Verint (US). These vendors have adopted different types of organic and inorganic growth strategies, such as new product launches; partnerships, agreements, and collaborations; and mergers and acquisitions, to expand their offerings in the market.